Sleep is important in critically ill patients for recovery and survival. However, intensive Care Unit (ICU) patients almost uniformly suffer from sleep disruption. 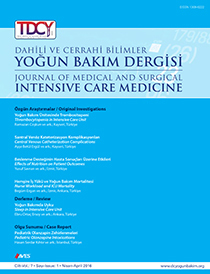 A harsh ICU environment, noise, light, underlying disease, mechanical ventilation, and drugs are the main reasons that underlie sleep disruption in the critically ill. All these factors may play a role in development of sleep disturbances in this patient group even though there is no agreement about which of these factors is the primary cause of disrupted sleep. Measures to improve the quantity and quality of sleep in critically ill patients include careful attention to mode of mechanical ventilation, decreasing noise, and sedative agents. The aim of this review is to explain the interrupting factors of sleep in intensive care unit.